Here are a few of the Hotels we are looking at to stay in when in Hanoi. So far we think the first one, VietAnh Hotel, is the best but I asked my traveling companion, Barbara, if she thought we could afford the upgraded room at $35 a night. Well we are staying at the Frung Nam Hai Hotel, read on! Hotel Selected ~ Hong Ngoc2 Hotel: Barbara just wrote on 01-12-2007: I've been emailing more with Ly at Tonkin Travel. I hadn't found any scheduled Pacific Airline flights from Hanoi to Danang (which would be slightly cheaper). I had her check on price and availability for the two remaining flights we need. What she quoted with taxes was pretty much what I'd found so I went ahead and booked with her. All our flights are on Vietnam Airlines. She asked for the name and address of our Hanoi hotel so she can have our tickets delivered to us. When I told her we had reservations at the Trung Nam Hai Hotel, she suggested that we may not want to stay there. She said it's across the street from a hospital and that Vietnamese hospitals aren't very sanitary. She said there are much better located places to stay. I asked her to check and advise and gave her our dates. She wrote back to confirm reservations at the Hong Ngoc2 Hotel also in the old town area. She said the immediate area is much nicer and she's sent many people there with no complaints. Trung Nam Hai Hotel - Trung Nam Hai Hotel is located among the 36 streets of the Old Quarter in the heart of Hanoi. The Hotel is a short distance from all major tourist attractions such as Hoan Kiem Lake, the Cathedral , the Temple of Literature, Ho Chi Minh Mausoleum, One Pillar Pagoda,Vietnam's History Museum, Museum of Vietnamese Fine Art, and more. 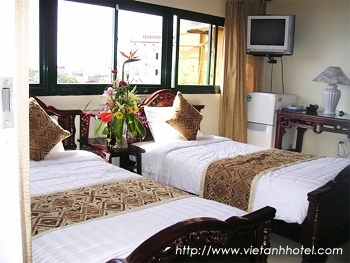 Trung Nam Hai Hotel offers affordable, luxurious accommodation in an authentic Vietnamese neighborhood. Shops are conveniently located near shopping center, the silk road, and small craft shops of the Old French Quarter In addition, there are excellent ethnic restaurants and coffee/tea bars. Includes breakfast, they have an elevator, free airport pickup, rooms have refrigerators, private bathrooms, individual controlled air-conditioning. VietAnh Hotel - We are in the centre of the town and it takes you only a few minutes to walk to the most famous landscapes and historic spots in Hanoi such as Hoan Kiem Lake (only 5 minutes), Dong Xuan market, the Temple of Literature, the One Pillar Pagoda, Vietnam Historical Museum, the Museum of Vietnamese Art, Ho Chi Minh Mausoleum and some other tourist attractions. It is situated very near to banking and shopping streets, diplomatic and public offices and is extremely convenient for activities for both travelers and businessmen. This hotel has some massive rooms they also have two separate verandas, side by side! The cheaper rooms are off the street and are not only quieter but also far more sensibly sized. Double check your reservations here, as there was a major disagreement going on in that regard when we wandered in. Sunshine Hotel - Opening on Sep 8, 2006 the Sunshine 2 hotel has become popular very quickly because of the high quality of service. It has 7 floors with 20 rooms accessed by an elevator. The rooms are well equipped with air-conditioner, private bathroom with hairdryer, hot water, IDD telephone, refrigerator, free ADSL internet connection, cable TV, decorated appealingly, queen size bed and twin bed. Computers are also available in suite rooms. The Sunshine restaurant serves 3 meals daily with Vietnamese and Western food. Includes breakfast, they have an elevator, rooms have refrigerators, private bathrooms, individual controlled air-conditioning. Hanio Elegance - Ideally located in the heart of Hanoi ¢s Ancient Streets, just a minute`s walk to the famous Hoan Kiem Lake (Sword Restored), Hanoi Elegance Hotel offers a modern and diverse range of facilities and services. The hotel`s location is very convenient for guests with shopping and banking facilities, as well as eating and entertainment options all very close by.With spacious and well-furnished rooms, Hanoi Elegance Hotel offers you much more than a 3 star hotel.All the rooms in the hotel have wooden floors and are equipped with IDD telephone, air-conditioning, cable TV, DVD player, refrigerator, comfortable bathroom, (bath-tub and shower), hair-dryer, coffee and tea making facilities, private computer with ADSL for free. Thien Thai Hotel - Thien Thai Hotel is ideally located at the north west corner of Hanoi Old quarter, near Dong Xuan market, but the Thien Thai Hotel itself also not too far from West lake (Ho tay), and it is in a quiet street. The motto of Thien Thai Hotel is bring you to the paradise as it is name in English. Includes breakfast, they have an elevator, rooms have refrigerators, safe deposit boxes, mini-bar, private bathrooms, individual controlled air-conditioning. Restaurant located on the ground floor of the hotel, offers Vietnamese barbecue and a lot of traditional Vietnamese food. Sky Bar (on the 11th floor) has a cozy atmosphere. Guests can enjoy the breath-taking views of Hanoi city, the legendary Long Bien Bridge, the mighty Red River and the magnificent views of the Westlake. The bar servers cakes, pizza, pastries, chocolates, snack, fast foods, and selection of coffee, tea, etc.